Child Welfare social workers need to know every child’s story, inside and out, to ensure the child is safer tomorrow than they are today. However, critical case information that tells this story is often hidden or virtually impossible to retrieve. Social workers are forced to sift through hundreds of pages in a case file to familiarize themselves with the complete history of a case before making critical decisions or launching an investigation. That's where Traverse®: Case Discovery comes in. Traverse leverages next-generation technology for Protective Services to present a complete picture of a child or family’s past and present to safeguard their future. Traverse presents a child's whole story in an easily digestible, interactive view. It surfaces dark data—case content that is hidden or virtually impossible to retrieve—through a Protective Services lens so social workers are informed about prevalent topics, important people connected with the family, and key events. In addition to case discovery, Traverse also includes data collection and content collection, allowing social workers to collect, view, and share content and data anywhere, anytime. The combination of data collection, content collection, and case discovery empowers social workers to do more high-value work with families to reduce trauma. Don’t just take our word for it. Check out our full library of user stories and videos to see how Traverse empowers Protective Services with critical information to quickly see the whole picture when making safety decisions. You might want to think again. Child Welfare agency directors we work with estimate that more than 80% of the information their agencies collect, process, and store at any point in a child’s life is not effectively utilized by agency staff when they make safety decisions. The problem is that the digital age has dramatically increased the volume of information, which is coming at social workers faster than they can manage. Captions on photographs, social media, emails, treatment plans, medical records, and school and court records are just a handful of examples of dark data in Child Welfare. This hidden information cannot often be utilized by agency staff when making safety decisions for children. 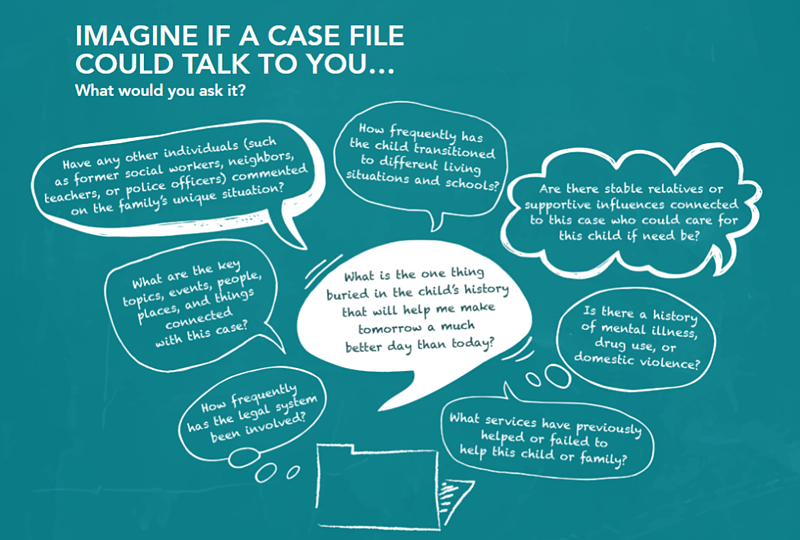 When social workers don’t have access to the information they need, the children they serve are at risk for further trauma.